Real estate stocks experienced slight dips on Thursday, following the Fed's rate increase by a quarter point. REAL ESTATE stocks experienced slight dips on Thursday, following the Fed's rate increase by a quarter point. Analysts said these price declines were by no means drastic as much of the expectation had already earlier been priced in. Widely anticipated in financial markets for several weeks, futures traders had already put the probability of a rate increase at 100 per cent. Azure Capital chief executive Terence Wong told The Business Times: "I do believe that the writing was already on the wall." Rather, what took some aback was the more aggressive path for tightening that policymakers at the US central bank had plotted for 2017. They are expecting three 0.25 per cent rate increases in 2017, up from the committee's forecast for just two when it met in September. RHB property analyst Vijay Natarajan said: "The only thing a bit unexpected was the Fed's hawkish statement of three hikes next year instead of two." Maybank Kim Eng analyst Derrick Heng concurred: "The market was primed for another one to two rate hikes in 2017. Three rate hikes is slightly higher than expectations." Whether this would eventually pan out is anyone's guess. Taking reference from history, some analysts had their doubts, believing that uncertainty from other economies could limit the exuberance of the US recovery. After all, last December when the Fed raised rates for the first time since the central bank cut borrowing costs to near-zero in 2008, policymakers had predicted no fewer than four rate increases in 2016. In the end, only one materialised due to global financial market volatility, first caused by a Chinese stock market rout, and later Britain's unexpected vote to leave the European Union. 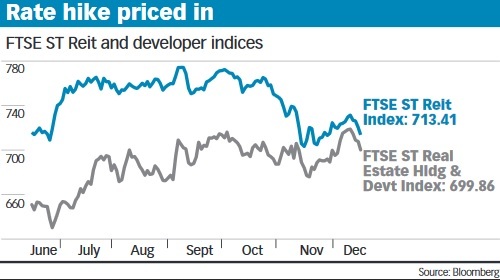 On Thursday, the FTSE Straits Times Reit index fell 0.9 per cent, while the FTSE ST Real Estate Holding & Development Index (which tracks property developers) fell 1.1 per cent. An increase in short-term rates affects borrowing costs for both real estate investment trusts (Reits) and developers. A rate increase for longer-dated bonds will also set a higher reference point for capitalisation rates used in valuing investment properties for both developers and Reits. Higher interest rates also make Reits less attractive compared to other safe haven instruments such as government bonds and fixed deposits. This would thus impact the demand for and share prices of Reits. Low Xin Yan, an analyst at investment management firm Henderson Global Investors, said: "Technically, the Fed raising rates does not matter for Reits, as commercial real estate - which are the Reits' main focus - is priced off the long end of the interest rate curve, not the short end. "Instead, movements in the short end will have a greater impact on the residential business for developers as rising mortgage rates may impact affordability and buyer's demand. . .
"For Reits or developers which have a large proportion of their business in investment properties, long-term bond yields also matter more." Liu Jin Shu, head of research at independent equity research firm NRA Capital, said that developers which have been taking advantage of the low interest rate environment to gear up and expand voraciously will see slower growth now in a higher interest rate climate. Not only do they have to be more careful when taking on new projects now, having to refinance existing loans at higher costs will also cut into their profit margins. "That said, there is value to be found in developers that are more conservative. Some have been slowing down in their land-banking activities, conserving cash, and staying off debt. These developers will benefit in the long run because they have reserved ammunition for long-term growth." Mr Liu added that the trajectory of rate increases is also important. More rate hikes down the road will raise the cost of borrowing for three- or five-year bonds, for example. Ms Low added: "In the short term, we do see scope for bond yields to continue to trend higher. However, our long-term view is more balanced. The recent sharp moves (in US 10-year bond yields) have been fuelled mainly by expectations, but the reality remains uncertain." The execution of US president-elect Donald Trump's plans to boost government spending and cut taxes remains a question mark. Ms Low believes that long-term structural issues which have dampened global growth and inflation over the past decade will also not be easily reversed, so interest rates should remain structurally lower compared to historical levels.